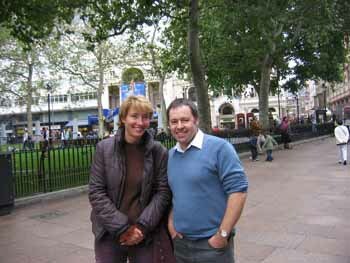 Emma Thompson - writer and star of the film - with me, Keith Pickering, outside the Odeon cinema in Leicester Square, London. We'd just watched the first screening of the film on September 18th 2005. This was a private screening for members of the cast, crew and others connected to the film. We got to see the film even before the 'world premier'! My wife and I sat right through to end of the credits to see my name up there. Nearly everyone else had left before my name came up - but it was there!. If you watch the DVD just fast forward to the end of the credits. 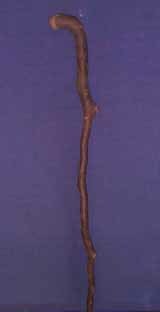 Here's the stick I made to Emma's specifications. It had to be "natural and organic looking with lots of lumps and bumps". The first three I made were too straight and regular - this was my fourth attempt to get it right. This is the actual photo I e-mailed to Emma. When she saw it she asked to see the stick itself so it was posted down to London. Apparently it was just how she'd imagined it when she wrote the story! I used a branch I'd cut from a beech tree a couple of years previously - not knowing what it might be used for. I just cut it because it looked interesting. I trimmed the side branches but left them sticking out a little bit. The top had grown right round in a curve so I cut it short and rounded out the end. I carefully sanded the whole stick, straightened out the worst bends (see my "Stick Press" on the diy page), leaving the remaining ones so they still left the stick 'crooked' but in line. The whole stick was given several coats of oil to protect it and a metal ferrule was fitted to the tip. The film company had asked for three identical sticks - they need duplicates of everything in case one gets lost or broken - but in this case I told them it was an absolute one-off so they had to make do with it. It survived the months of filming because Emma told me In a phone conversation) she had the stick at home. Her assistant phoned me a few months after the film had been released to say that Emma had taken the stick all round the world with her during the promotion of the film and it had appeared in lots of TV and magazine interviews. Since then it has appeared in the second Nanny McPhee film and survived that too! Although I can't ever replicate the stick - because it was one of nature's one-offs - I sell lots of hazel and ash knobsticks cut from the same ground here in North Yorkshire. I have managed to make a few "similar" to the real stick, mainly for children. If you'd like to order one "similar" to the real thing then you can place an order for one by clicking here. Here's the private invitation that I got to the film screening in London (my name is on the back). This picture was also used on the promotional posters for the film.